The second and final draft of NRC left out a large number of people. While officials were quick to ensure that it is still a draft and nobody should be harassed for being left out of the draft, the news from different corners is not very assuring. While mainstream media and a section of politicians are busy declaring these people as illegal immigrants, there is another kind of problem befalling these people. A look at the NRC made one thing very clear – a large number of poor, illiterate people who could not provide adequate documents or whose documents were inconsistent were left out of the final draft. What has worsened the situation is the rise of some vigilante groups which are already limiting the mobility of these people based on this draft. It is a known fact that a large number of people from Assam travel to neighbouring states and work there as daily wage earners. Lack of opportunity in a way forces these people to move outside the state and stay away from home to ensure that their families don’t go hungry. It is this section of the people who are facing harassment. It seems police officials along with student bodies have started demanding proof of citizenship from people travelling to Meghalaya, Nagaland and Arunachal Pradesh. And those incapable of proving that their names have been incorporated in NRC are made to return and not allowed to enter these states. 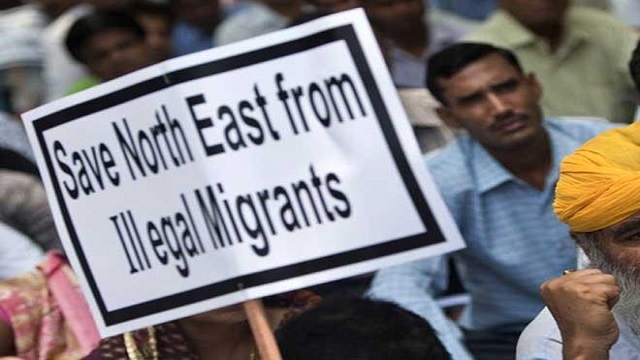 There are reports that civil society groups and student organizations in Meghalaya have set up check points and are pushing people back whom they believe to be illegal immigrants. While initially such news was coming from Meghalaya and Nagaland, it seems a large number of people from Arunachal Pradesh have been sent back for being unable to show that their names have been incorporated in the NRC. Local media is doing its own bit to add fuel to the fire by already declaring these people as potential foreigners. While law enforcement agencies have intensified vigil on the inter-state borders, some social organizations have also started parallel vigil and checking vehicles carrying migrant workers. Arunachal Pradesh marked 17 August as the deadline and asked all people working in Arunachal Pradesh without an Inner Line Permit (ILP) to leave the state. The All Arunachal Pradesh Students’ Union threatened to start the “Operation Clean Drive” to throw out such people. The student body carried out this process and in fact forced a large number of people to return to Assam. And ironically local news media is already lamenting that ‘illegal foreigners’ are again dumped in Assam!! Various organizations on the other hand have appealed against such vigilantism. In fact both the Chief Minister of Assam and the leader of the Opposition have reached out to CMs of other states to ensure that the harassment of the people of Assam traveling to these places stop. Also there is a need to ask how legitimate the activities of these vigilante groups are. Where do we draw the line? While the final list is yet to be published, people are already made to bear the brunt. It is with utmost concern that we should remember that a large number of migrant workers from the state go to other parts of India. If they are forced to leave these states on mere suspicion, then the situation in the home state will also worsen on multiple fronts. A large number of migrant workers from Assam go to Lucknow and work as rag pickers. Even amongst them this fear is prevalent that police might go to check whether their name is present in the NRC or not. It is evident that some people are using the draft NRC which has again excluded a large section of genuine Indians to harass people. Using this draft as whipcord and disrupting mobility of people across states will further worsen the condition of already marginalized people. While the latest directives from the Supreme Court about the new modalities have not exactly given much respite, this vigilantism is making things more difficult. People whose names have been left out of the final draft will be given an opportunity to provide adequate documents and prove their citizenship. While the new modalities have taken into cognizance the special cases like that of orphans, women who have submitted panchayat certificates have been asked to either submit documents again or bring local witnesses. Local witnesses during hearing might solve the problem of many but there is also the question of discretionary power of the verifying officer. In a state where illiteracy and poverty is rampant, the NRC updating process cannot be indifferent to these realities. The scope of discretion should not be biased against the people. The need of the hour is to see that people are not harassed on mere suspicion. And till the process is complete, people are not barred from working for their livelihood. Such vigilantism needs to be curbed as they are not only extra-legal but also against a class of poor workers. While the people of the state of Assam have been very patient with the cumbersome process of updating the NRC, similar patience is expected from others as well.